I eat bundles of sweet potatoes. I buy bags and bags of them every month. If Whole Foods kept track of sweet potato purchases, I would be their top customer. I’m supporting a significant number of sweet potato farmers. I don’t need a gold star or anything. I’ve learned to love them, but only as they’ve become the alternative to regular potatoes in my new paleo life (queue twilight zone music). Before falling madly in love with a man who can’t tolerate gluten, most starches, or dairy, I detested sweet potatoes. I ate them just once a year, either at Thanksgiving or Christmas, when I would travel back to Gram’s house for the holidays. Her sweet potatoes, adored by many, were never my cup of tea. They were cooked to death, mixed with butter and brown sugar, and then topped with an entire bag of mini marshmallows. To be fair, I think I could get behind the dish if it had some sort of crust and was served as a dessert with whipped cream. But alas, her sweet potatoes were always set out on the table alongside the stuffing and mashed potatoes, and I felt obligated to take a small spoonful. 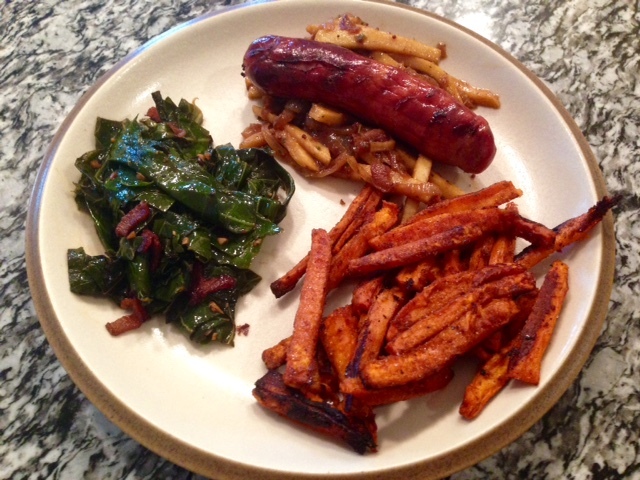 These days, the presence of sweet potatoes on my dinner plate feels like a treat. When I sink my teeth into their creamy, slightly sweet flesh, I’m reminded of the bliss one experiences when eating French fries, mashed potatoes, or a baked spud. Believe me, I’ve tried substituting sweet potatoes in all of these applications with varying success. My favorite by far, and the recipe I’ll share with you below, balances the natural saccharine flavor of the sweet potato with savory spices in the form of a French fry. Tell me, who doesn’t adore a French fry, in whatever makeshift form it may take. It blows my mind that I’ve had this blog for going on six months and I haven’t yet shared a sweet potato recipe. I eat them almost every day and now consider myself an expert in this sweet little tuber. Shame on me for not sharing sooner. 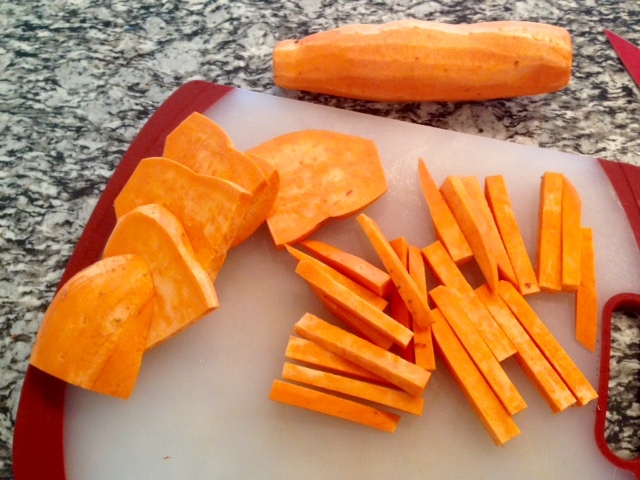 Peel the sweet potatoes and cut them into fry-shaped pieces. 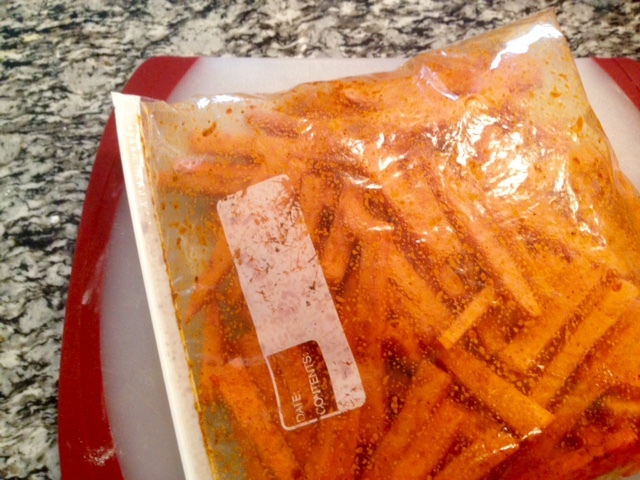 Place all of the uncooked sweet potato fries into a gallon sized plastic bag and add the remaining ingredients (oil, cornstarch, and spices). Shake the bag vigorously until all of the seasonings are equally distributed. 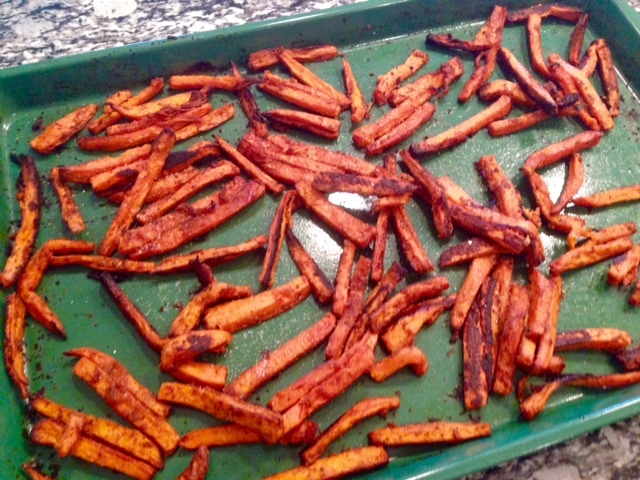 Arrange the fries in a single layer on a non-stick cookie sheet (Super important! They’ll steam and never become crispy if you try and cram on too many). Bake for 20 minutes. 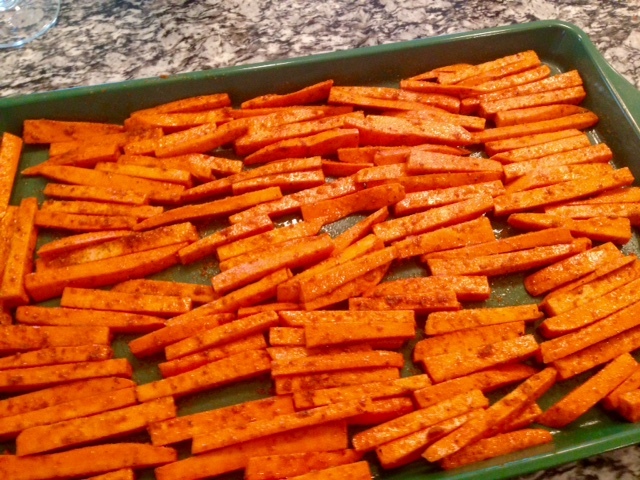 Remove from the oven and flip the fries over to ensure evening browning. Return to the oven and bake for another 15-20 minutes. Remove the fries when they’ve reached your desired crispness. Serve with your favorite condiment. I love to mix equal parts of ketchup and sriracha for a spicy zip.